The ship is scheduled to dock at the port of Sabang, located within walking distance to the town. Taxis may be available outside the terminal building. Be sure to agree on the fare before leaving the port. Sabang Island, Pulau Weh, lies off the northern tip of Sumatra at the northern entrance to the Strait of Malacca and is the first Cruise Port in the Malay Archipelago for vessels coming from the west. From the harbor, built in 1887, you can reach some glorious beaches virtually untouched by tourism. 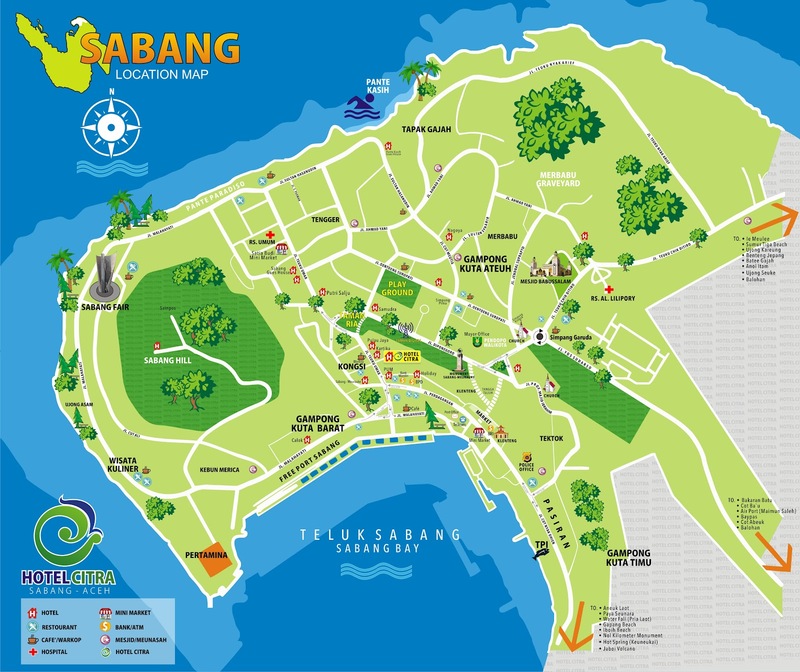 Sabang is a cozy town with a sleepy yet charming old colonial atmosphere. Many towns have taxis, but be sure to agree on a fare in advance. The reefs along nearby Sabang Fair are particularly nice for snorkeling. Gapang and Iboih beaches are the most popular and offer swimming, snorkelling and diving opportunities. A 40-50 minute ferry ride is necessary to reach these areas and the local ferries can be inconsistent. Enjoy the local restaurants and coffee shops, don't miss the traditional Acehnese coffee. In Indonesia eating with your hand (instead of utensils like forks and spoons) is very common. The basic idea is to use four fingers to pack a little ball of rice, which can then be dipped into sauces before you pop it in your mouth by pushing it with your thumb. There's one basic rule of etiquette to observe: Use only your right hand, as the left hand is used to clean yourself in the bathroom. Don't stick either hand into communal serving dishes: instead, use the left hand to serve yourself with utensils and then dig in. Needless to say, it's wise to wash your hands well before and after eating. Eating by hand is frowned on in some "classier" places. If you are provided with cutlery and nobody else around you seems to be doing it, then take the hint. ATMs are few in Sabang. Internet: Prices vary considerably, and as usual you tend to get what you pay for, but you'll usually be looking at around Rp 5,000 per hour. In large cities, there are free hotspots in certain shopping malls, McDonald restaurants and Starbucks cafes. Some hotels provide free hotspots in the lobby.